The Dow opened in the red by over 100 points to start Monday morning’s trading session, showing the ill effects of more trade concerns–this time, stemming from retaliatory tariffs imposed by Canada. Canada Prime Minister Justin Trudeau greenlighted new tariffs affecting $12.5 billon worth of U.S. goods on various consumer staples, such as chocolate, ketchup, yogurt, beef, caffeinated roasted coffee, orange juice, maple syrup, salad dressing and soups. Canada’s tariffs come in response to U.S. President Donald Trump’s recent tariffs on Canadian steel and aluminum. 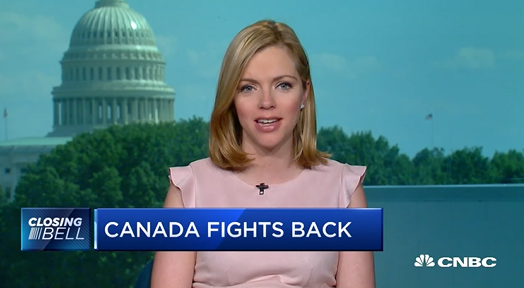 Canada is the latest company to join in on the fray against the United States after China and the European Union responded with retaliatory tariffs of their own.